After a highly productive day previously fishing on the Ban Pakong River Andy and Rob once again travelled upriver to a wide bend that had produced big fish in the past. After mounting livebaits onto super sharp Owner Mutu hooks the anglers placed the baits at various marks across the river. In the following hour several baits were retrieved showing signs of stingray activity with tell tale pad marks being found on the flanks of the baits. After re positioning the baits the anglers sat back and waited for events to unfold. A further hour passed before a screaming take alerted the anglers to a rapidly departing fish. Engaging the clutch on the reel saw the line begin to slow down as the fish felt the full weight of the heavy stand up rod. A fifteen minute battle followed which saw the fish characteristically clamping onto the riverbed on several occasions requiring the anglers to use the rod to pry the Giant Stingray from the bottom. Finally the freshwater stingray was brought to the surface where it was quickly secured by Nok. 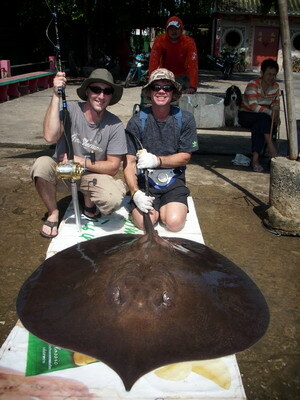 The Giant Stingray was brought to the riverside where it was identified as being a male of around fifty kg’s. The fish was released after all measurements were recorded and photography was completed.